A blue Chia (who looks suspiciously like the one that owns the Igloo Garage Sale) has snuck into the Snowager's lair and stolen some of the loot. You, as the Snowager, must chase down this pesky thief and reclaim your treasures. The controls for this game are fairly simple. You play the Snowager  whom you can move in a clockwise or counter clockwise direction using your right and left arrow keys, respectively. Your goal is to make the Chia thief  drop his loot  so you can pick it up while avoiding walls and watching out for powerups such as the one on the screen . (That particular powerup is a bad powerup, but we'll discuss that more later.) At the top of the screen is a counter showing how many treasures your opponent has  and how many you've picked up . There are three ways for your opponent to drop loot. First, he will sometimes simply drop a piece as he's running. Second, you can knock him over (like in the picture) by running into him with your head, causing him to drop three pieces. This doesn't work if he hits your tail; he'll simply jump over it. Finally, you can blast him with ice by pressing Space to freeze him in place and then hit him, causing him to drop five pieces. The top of the screen has an indicator showing how many blasts you have remaining . Also on the top bar is the number of lives you have left . The only way to lose a life is to run into yourself or a wall/trees. When this happens, you restart the round from the beginning and the loot count is reset, but you keep whatever points you earned from that round. Finally, your score is counted in the upper left hand corner  and options for controlling sound and ending the game are in the lower right . In addition to dropping loot, the Chia will also sometimes drop power-ups. These, like the loot, only count if you touch them with your head. This powerup multiplies your score by the number indicated. This powerup causes the Chia to drop all remaining loot. This powerup causes the Chia to freeze in place temporarily. This powerup gives you an extra icy blast. This powerup gives you an extra life. 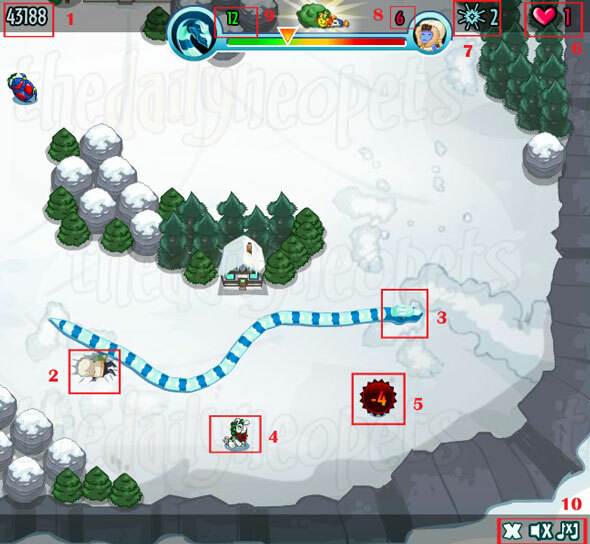 This powerup attracts all loose items towards the Snowager. This powerup causes the Snowager to speed up (it's best to avoid it if possible). This powerup causes the Snowager to drop the indicated number of items. This powerup causes the Snowager to slow down. There are three modes of difficulty. The biggest difference between the modes is how many items are required per level. One of the most important things to remember is that you are not on the clock. There is a time bonus, but it decreases very slowly, so there's no need to rush. While it's tempting to chase down that Chia and take care of it once and for all, just slow down and take your time and make sure not to run into things. Your tail gets longer as you gather more loot, so you'll have to watch out for that in the event of sharp turns. Another note is that you don't have to collect all the good powerups. I personally avoid the speed-up powerup because I'm more likely to lose control and hit a wall. The level of difficulty is very significant in this game. Easy is a nice, slow pace. The Chia runs fairly slowly, and the loot he drops remains on the ground. There are also fewer items required per level. Medium is a bit more of a challenge than Easy. The loot begins to disappear if not picked up quickly, and the Chia can run a little faster. If you're going for points, play the game on Difficult. The Chia runs much faster and the loot is more likely to disappear, but the higher number of items per round earns much more points. The loot also has an annoying tendency to ricochet on the higher difficulties, making it tougher to catch. If you're playing purely for neopoints, it's helpful to note that some items are worth more than others. To get your 1000 np in the least amount of time, you'll want to play on Difficult and target high-point items such as the tiny snowball (27500 points), faerie snowball (just under 7000 points), and the decorated negg and stained glass window (both 5000 points). Items will ricochet not only off the walls, but each other. Be careful - this can turn an easy-to-avoid stationary powerup into a dangerous moving one. The tighter the space in which you knock the Chia down, the easier it is to pick up the objects he drops (always make sure you have room to turn around though). If you collect the last piece of loot and crash into something right after, you still complete the level. Blast early, blast often. Use it when the Chia still has plenty of items to drop and collect as much as you can. You only have two blasts per level, so use them wisely. You can't hit the Chia while he's flashing right after he gets up. Wait until he stops flashing before you go after him again. If you're going for a trophy, you'll want to play on Difficult so you earn ~100,000 points in just the first level. Recall that points don't get reset when you lose a life, so you can keep playing level one over and over again, collecting all but one piece of loot before crashing into a wall or yourself to restart the level. Keep an eye on your lives if you do this! You'll have to make sure you pick up at least one extra life power-up before you crash so you don't accidentally waste all your hard Chia chasing. Overall, this is a fun, simple game very similar to freestyle Meerca Chase . And, once you blast through all 12 levels, that Chia is sure not to mess with the Snowager again.